Banner & Eblast Campaigns :: INHOUSE Productions Ltd.
INHOUSE was tasked to design and develop a series of 4 Flash and GIF format animated banners in 3 different sizes, in English and French, as well as an announcement html format eblast in English and French. 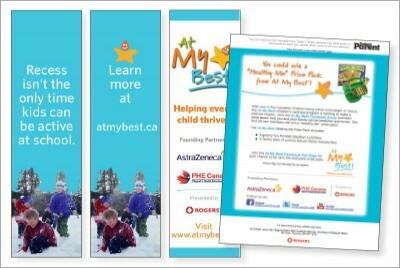 Each series of banners was posted online for client review and approval. INHOUSE prepared each banner according to Rogers Communications banner standards for deployment through the Today’s Parent magazine. Design and development by INHOUSE in May 2009 and May 2010 and June 2011.